In the Adventist view, two separate ideas are almost always completely conflated: (1) accepting Jesus as Savior and (2) joining the Adventist denomination. Probably most Adventists would admit that these are not the same things if they were directly asked, so it is unclear why they continue to speak of them interchangeably in their materials. 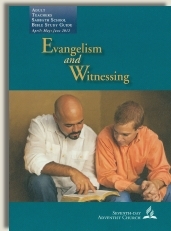 Incidentally, most of the time Adventists do not target non-Christians with their evangelistic efforts, but rather, they focus on proselytizing those who are already believers in Jesus. The purpose of their evangelistic meetings is to convince Christians that belief in Jesus is not sufficient for salvation; and until they adopt the Sabbath, they are at risk of 'not being ready’ for Jesus’ second coming. "Now, I want to tell you, my friend, GOD’S WORD HAS BEEN PRESENTED AND IF YOU DON’T RESPOND TO THE LEADING OF THE HOLY SPIRIT, YOUR NAME WILL BE REMOVED FROM THE LAMB’S BOOK OF LIFE." Our only safety is to continue to follow Him and not rest our salvation on some experience of the past. Yes, we can lose our salvation, that’s Biblical! Listen to Revelation 22:19. "If any man take away from the words of the prophesy of this book, God shall take away his part out of the book of life." Revelation 22:19. Don’t jeopardize your salvation. The Holy Spirit wants to lead you into ALL truth." 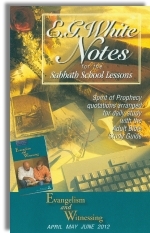 Source: Revelation Seminar Teacher’s Notes pg. 22-3 (Lesson 22). Copyright 1983 by Review & Herald Publishing Assn. and Revelation Seminars. Some progressively-minded Adventists may well disagree with these kinds of methods, but the fact remains that these tactics have been/are what the Adventist denomination uses to persuade folks to join. Furthermore, to call new Adventist members “New Christians” is simply not accurate. Many individuals who join Adventism are former Baptists, Methodists, and Catholics who did not know their Bibles well enough to recognize the theological errors and misinterpretation/misapplication of Scripture that occurs in Adventist evangelistic meetings.